I’ve been waiting to make this announcement for a while, teasing it on Instagram some weeks back; but today is the day. Introducing BACKSTREET, one of two secret sewing projects I worked on late last year. This quilt was one of a handful of quilts I designed as part of a freelance project; but this design was not selected which meant that I could do what I wanted with it and I knew immediately whom I wanted to offer it to. 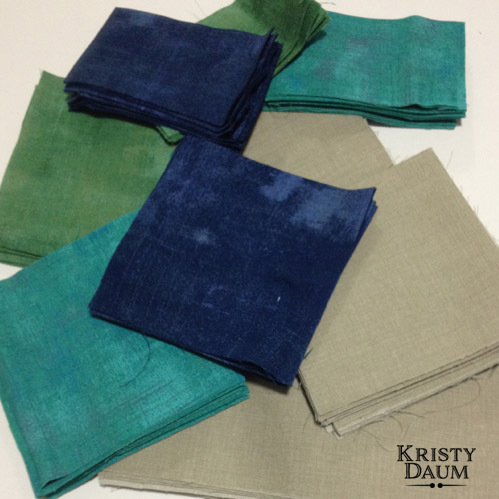 I don’t remember when I first “met” Kristy from Make Modern Magazine; but we joked about our shared first name and how weird it was to include both Hi Kristy! and Bye Kristy! in an email. When I was first introduced to the magazine, I wanted to submit something to them; but you know…life happens. Thankfully BACKSTREET was a fully-formed concept ready for submission and a few days later was accepted. You can find the pattern on pages 24-26. My Sister assisted me with the fabric selection; which meant a fun hour or so spent at my local quilt shop, Janie Lou. While I had reservations about my selection for the background, a subtle neutral from French General. 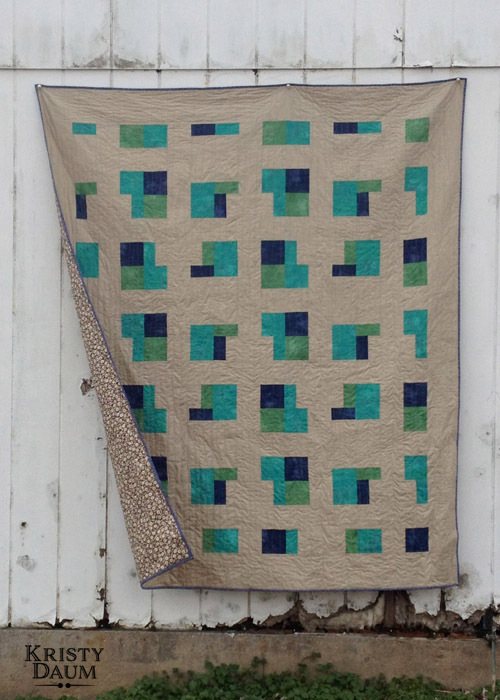 I’m happy that I stuck with it, as it allows this quilt to bridge both traditional and modern aesthetics. As for the colors, those are all Grunge from Moda particularly Jade, WinterGreen and Navy. The quilt is quite large, at 72" x 84" and was quilted with a subtle variegated cotton thread which I was given at QuiltCon last year. I chose to do organic straight-line quilting; which is one of my favorite ways to provide texture without too much fussiness. BACKSTREET is on loan to my Dad right now as I owe him a "Quilt of Valor”; but have not settled on the design yet. That story is for another day. Part 2 of this announcement is that Kristy and Jane from Make Modern Magazine asked if they could profile me in this issue for a segment called "Meet The Maker". 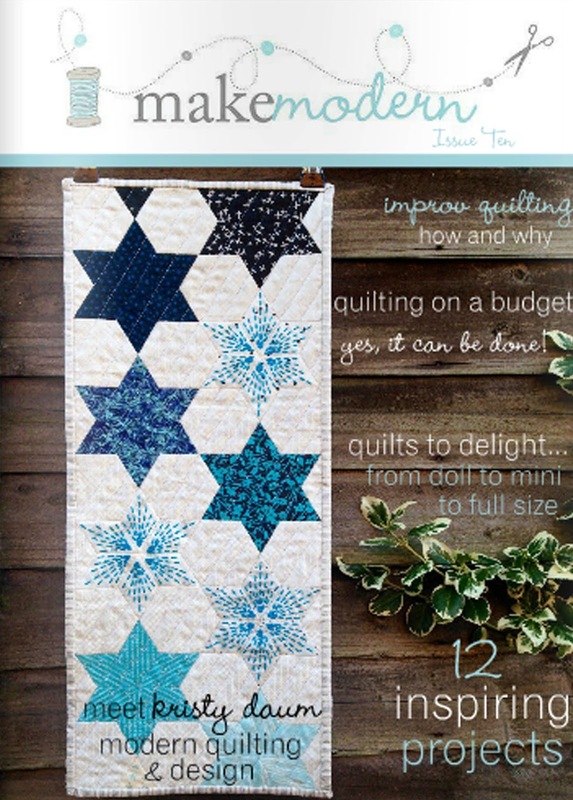 So, on pages 21-23 you’ll be able to read about my quilting journey and check out pics of some other quilts I have made. If you are interested in purchasing this issue (#10), or want to subscribe to this magazine (which is digital), please visit www.makemodern.com.au for more information.